The esteemed Gandhi Peace Prize has been conferred upon The Akshaya Patra Foundation by the Union Government on January 16, 2019. The jury under the Chairmanship of Prime Minister Shri Narendra Modi and comprising Justice Ranjan Gogoi - the Chief Justice of India, Smt Sumitra Mahajan - Speaker of Lok Sabha, Shri Mallikarjuna Kharge - Leader of the single largest Opposition Party in Lok Sabha, Shri L.K. Advani - Member of Parliament, has unitedly announced the prestigious award. The award recognises Akshaya Patra’s contribution in providing mid-day meals to millions of children across India. 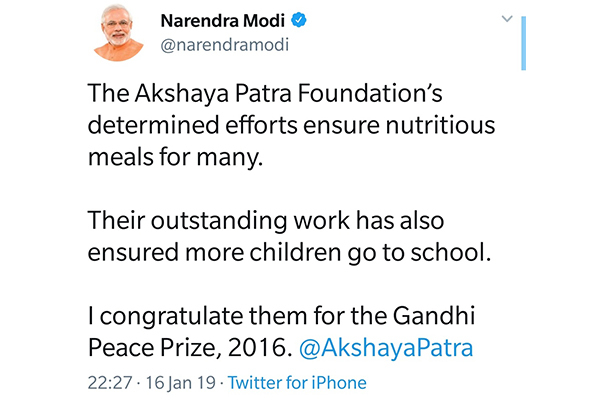 Appreciating Akshaya Patra’s incredible endeavour Prime Minister Shri Narendra Modi said, "The Akshaya Patra Foundation's determined efforts ensure nutritious meals for many. Its outstanding work has also ensured more children to go to school. I congratulate Akshaya Patra for the Gandhi Peace Prize, 2016." Extending humble gratitude Shri Madhu Pandit Dasa, Chairman of The Akshaya Patra Foundation said, "Thank you Modiji for the Gandhi Peace Prize. Your constant patronage for Akshaya Patra's mission from beginning days as Chief Minister of Gujarat and as Prime Minister has been a big strength." Akshaya Patra has jointly bagged the prize with Sulabh International which has been recognised for its contribution in improving the condition of sanitation in India and emancipation of scavengers. The prize includes an amount of Rs. 1 crore, a citation, a plaque and an exquisite handicraft/handloom item.